So far, only 25 per cent of the nearly $540 million needed this year has been received, the organization’s humanitarian affairs office, OCHA, has reported. 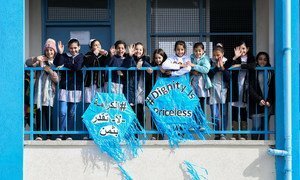 UNRWA provides education, health care and social services for more than five million Palestine refugees across the Middle East and is the single largest humanitarian agency in the OPT. It is funded almost entirely by voluntary contributions from UN member states. UNRWA chief Pierre Krähenbühl this week described 2018 as “a year of anguish” for Palestinians, with thousands of young people killed or injured in demonstrations in Gaza and elsewhere. At the same time, his agency has faced “its worst crisis ever”, and only has enough money to fund its operations until the end of September. “UNRWA’s current shortfall is US$ 217 million,” he told its Advisory Commission on Thursday. Overall, two million people in the OPT are in need of “active protection measures” due to conflict and violence, displacement or restricted access to employment and essential services, according to Jamie McGoldrick, UN Humanitarian Coordinator for the region. He said this has been “particularly evident” in recent weeks following an escalation of hostilities between Palestinian armed groups and the Israeli forces. “Since 1 July, we have seen the deaths of four Palestinian civilians, including that of a pregnant mother and her toddler child while asleep in their beds in Gaza, and the injury of two Israeli girls by rocket fire in Sderot, among some 100 Palestinian civilians and nearly 30 Israelis injured. In spite of this, the outside world appears numb to the tragedy unfolding,” he said in a statement issued ahead of World Humanitarian Day, observed this Sunday. The annual commemoration pays tribute to the aid workers who risk their lives supporting millions worldwide affected by conflict, natural disaster and other emergencies. 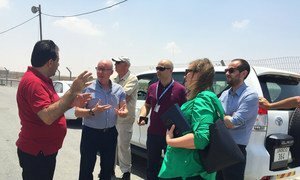 Mr. McGoldrick praised humanitarian workers in the OPT, adding that they “regularly face personal risk and assaults on their dignity, often while withstanding the same restrictive conditions that drive the humanitarian crisis” there. To avert hospital closures and raw sewage overflowing onto the streets of Gaza, the United Nations Humanitarian Coordinator on Wednesday called on Israeli authorities to allow UN-purchased emergency fuel back across the border of the Palestinian enclave.